When ordering a new euro cylinder the two most important measurements you must obtain are the internal size and external size of the existing euro cylinder. These are simply measured from each end of the cylinder to the centre of the screw hole in the middle of the cylinder. All measurements are in millimeters. We supply a wide variety of types and sizes of Upvc door lock cylinder barrels. These are available in Gold or Silver / Chrome finish. Our recommended euro security cylinder is the ABS euro cylinder as upvc door cylinder snapping & bumping is on the rise. With everyday tools a burglar can get past a standard door cylinder in less than 30 seconds. The ABS cylinder has special built in snap secure technology that ensures that if the door is attacked the cylinder snaps from the outside and blocks access to the internal mechanism of the door lock. The ABS euro cylinder features unique patented technology that locks the cam in position when the cylinder comes under attack, however if security is not paramount we also supply a full range of standard type full and half cylinder barrels to suit any Upvc door lock mechanism. What is a euro cylinder? A euro cylinder is a part in the door lock that can be changed easily, this can also be referred to as a door barrel. 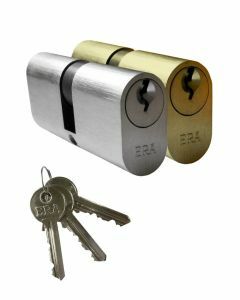 The euro cylinder is a self-contained part which turns the actual lock mechanism inside the door. The construction of the euro cylinder is essentially a series of pins which meet with a pattern on the key, so when the key is inserted it allows the barrel to be turned, this allows the cam to turn in the center unlocking the door. Burglars have discovered what the locksmith and hardware industry have known for years. 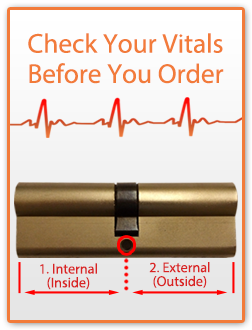 It doesn't matter how many hook or dead bolts you have on your door, the weak point is the cylinder lock. Due to inherent weakpoints in the door cylinder lock, having little material to give robust strength and the screw fixing enhancing this weakness, using simple tools, a burglar can "snap" the cylinder and gain access to the door mechanism and open the door. Lock Snapping is a method to exploit a vulnerability in the Euro door cylinder, as the title implies this where the cylinder is snapped and a special tool is used to unwind the locks on your door. The weakest point on a euro cylinder is the middle fixing screw and if too much of the cylinder protrudes from the door this can be clasped and twisted to break the cylinder. This is another technique where the pins of the lock are bounced in to a straight line, a quick action will then turn the cylinder lock. The process to enter a home using this method can be very quick and easy for an intruder. Why should I change my existing cylinder? Doors that have been fitted some years ago are fitted with the older style cylinders that have little in the way of in-built security features. Today’s cylinders have enhanced security features such as anti-pick, anti-drill and both bump and snap resistance features built into the design as standard. What are today’s standards for secure lock cylinders / barrels? BSI Kitemark and Secured by Design are the most recognised badges of quality and security in the UK. The Abs Cylinder has both the BSI Kitemark and Secured by Design accreditation. These standards today test and very effectively for bumping, picking and drilling. How to measure a euro cylinder?